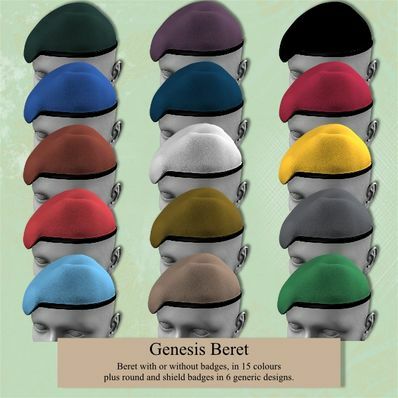 A Beret with or without badges for Genesis for use in Daz Studio 4. 15 colour textures for the beret plus 6 round and 6 shield generic badge designs. Add texture required to beret first and then the badge. If you choose a shield badge when you already have a round badge, go into Surfaces tab and select the badge you don't want and set the Opacity to zero. The badge you want should be set to 100%. Unbelievable what you have! Not to find anywhere else! Thx a lot! Awesome as usual, thank you again. Super, worked with the Special Forces back in the day.